When I begin organizing a collection, I start with a quick survey to help determine what types of material are in the collection. For me, this involves listing the formats in the collection, identifying the creators (if it is a collection of family papers), and the general years of the material. I also make note of any torn/damaged records, as I prefer to know about them before I start moving things around and possibly separate the pieces or completely tearing an item that only had a small tear because it snags on something. For collections of family papers, I go back through the material and begin separating the material by creator without analyzing the content of the records in depth. Once completed, I begin organizing the series into sub-series as necessary. Before creating sub-series for your collection, it is important to understand that collections are hierarchical, where aspects of a higher element carry down to each lower element. If the collection were the Bellamy Family Papers, then all the items in the collection relate to the Bellamy family, hence the collection’s name. Within that collection, you would find series for each of the family members – Rufus, Edward, Emma, and Marion. Those might be the only series in the collection if it was small, but if there were multiple boxes of material there would be sub-series for each creator’s records to help organize them. Rufus and Edward’s series might each have a sub-series of correspondence, but the only records contained in those sub-series would be their respective correspondence. If your collection has one creator, then the hierarchy of the collection would be slightly different from the example above. If the collection was the Daniel Hanifan Papers, then all the material would relate to him and the series would likely be similar to the sub-series from the Bellamy Family Papers, i.e. correspondence, diaries, etc. The series or sub-series that you create can reflect the format of the material or the reason for its creation. Series that reflect the format of the material would include correspondence, photographs, or diaries. Series that reflect the reason for the records creation include business papers or any other topic covered by the records. If you have trouble devising series for some material, it is okay to create a miscellaneous series to place items in. How you physically arrange the material within each series or sub-series is up to you as long as you are consistent. 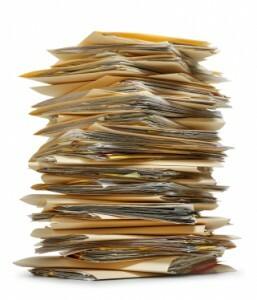 For example, it is perfectly acceptable to place correspondence in folders by sender or by date.